Ok, I admit defeat. I keep promising to blog recipes more regularly, but let’s be honest, the last time I said that was February! It’s not that I don’t want to. Really, I do. But I just don’t have the time anymore and my job involves me cooking for hundreds of people every weekend and leaves me too tired to be creative. All I am capable of is cheese on toast! So, if I am going to be honest, then I have to make this blog a Winter thing. Which is no bad thing. I have more time and I also get hungrier! Cold weather naturally makes me want to feed. I need to build up my Winter tummy ready for my grueling Summer workload where I inadvertently get a bit thin every year. 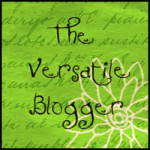 And when you are out of the practice of blogging, coming back can be hard. My first attempt at a recipe to post was just not good enough! So that delayed me for a while, until I worked out a way to rescue it. And you know what, there is nothing wrong with telling the story of a failure that comes good in the end. I think it makes a better story. So it all began at a restaurant in near-by Lectoure where we had the most glorious slow cooked lamb. Literally melt in the mouth stuff, falling apart the moment you nudged it with your fork. And so I was inspired. My slow cooker gathers dust in the Summer, but is cleaned up and appreciated once more once the cold weather sets in. So I bought a leg of lamb, wrestled out the bone and butterflied it. Spread it with garlic, sun dried tomatoes, rosemary and anchovies. I popped it in the slow cooker with some wine and stock and left it on low all night long. Strangely, the resulting lamb was dry. I guess I cooked it too long. And perhaps leg of lamb was not the right cut for long slow cooking. I needed something fattier. But what to do with the leftovers? It required moisture so I decided on a soupy stew packed full of beans, peas and lettuce. 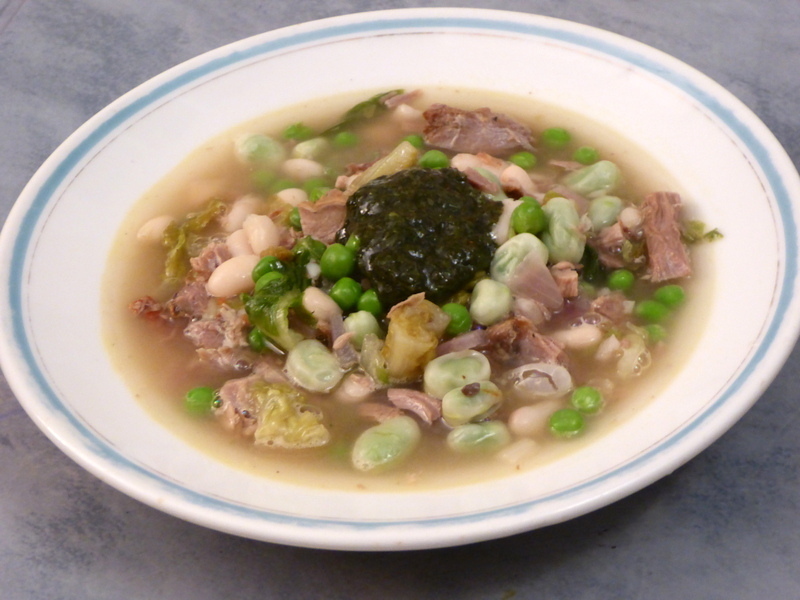 A sort of lamb version of ‘Petit Pois a la francais’. With a dollop of perky mint sauce on the top, it was simple, hearty and delicious. A Winter dish for a Winter blog. A few more failures that turn out like this and I will be well fed indeed! In a large pan, heat the olive oil and add your onions and garlic and cook for a couple of minutes. 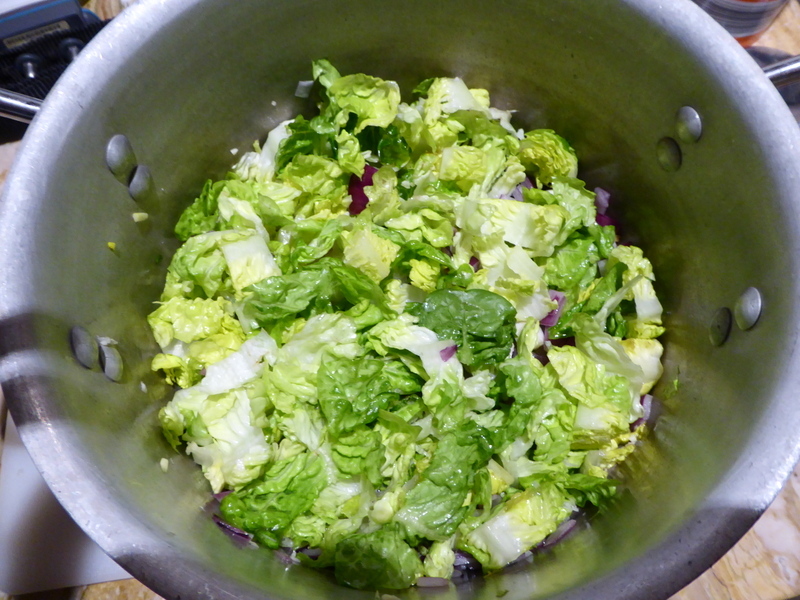 Then add your lettuce and cook until wilted, around 5 minutes. Then add your broad beans and heat through for a few minutes. 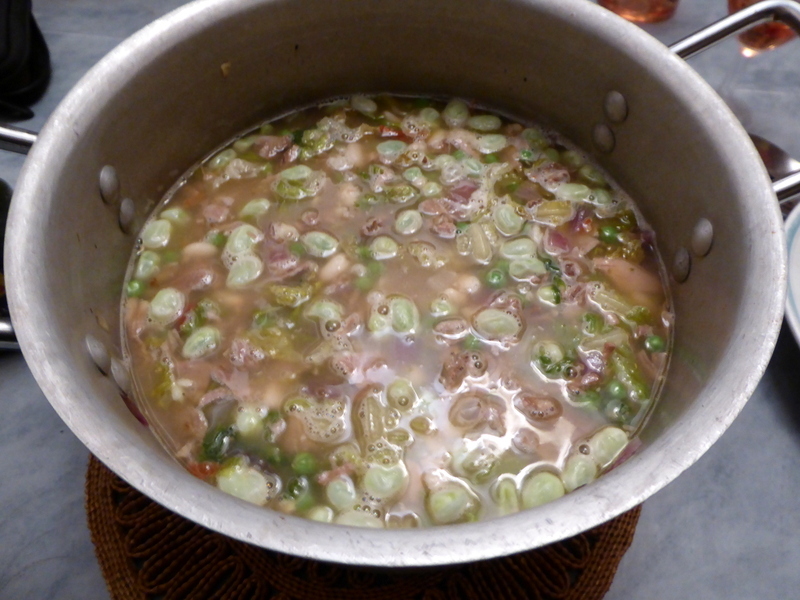 Then add your peas, white beans, stock and lamb and gently cook for 10 minutes. Serve in bowls with a dollop of mint sauce and crusty bread. How simple is that? And finally, I am delighted to say that I was selected as one of the Top 20 Food Bloggers of 2015 by HolidayLettings.co.uk ! A lovely surprise and an honour to be selected. And I was also interviewed by The Wall Street Journal! For their article – 14 Expat Food Blogs to Read Right Now. I couldn’t be prouder !